The Lisbon trams: everyone knows and loves them, jerking and rumbling their way across the city. They also appealed to me. But trams in service are something very alive: always moving and never still for very long. How could one paint them in peace? I tried out different trams, following one from the last stop to the other end of the line, forever hoping to find one in a “state of peace”. But there never was one. Hmm, what should I do? Then I had an idea. The Elevador da Glória is not a tram, but a cable car . However, the two lines connect the lower and upper parts of the city in a shuttle service and they stop for quite a while at both end points. I walked to Restauradores Square and travelled along the steep, mere 300-metre stretch to Bairro Alto at the top. It was here I found the ideal spot, as the cable car stopped in front of some steps, where I could spend the whole day painting the cable car as it took a break. I spread out my painting things. As it was working, I dedicated myself to my surroundings. "Ah, the Lisbon tram!" many gladly exclaim when they see this picture. I do not contradict them, but enjoy remembering journeys through the city. 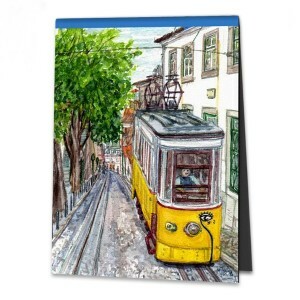 And who knows, perhaps these cables cars have in fact once sauntered through beautiful Lisbon.